"Professional Wedding & Party DJs"
We have over 20 years' experience in providing quality DJ and karaoke at weddings, kids' parties, family functions and local indoor festival events. We pride ourselves in our service and presentation, providing quality parties to suit all budgets, using only professional grade equipment. PartyManchester can, at your discretion, arrange children's and adult party games to entertain your guests during the course of the evening. We never set up on a pub table as we have a full DJ booth, which is adjustable to fit the space we are given. We have an online event planning system which allows you and your guests to submit song requests and allows you to plan the timing of events during the evening (buffet etc.). We carry a selection of Ukrainian music should you require a traditional Ukrainian dance. Take a look at our website and Facebook page to see some of the great parties we have been involved with. Required by many venues, Party Manchester has a current PLI policy with Mobile DJ Network in the amount of £10 million. Also required by many venues, Party Manchester has not provided satisfactory evidence of having current PAT records available. A Method Statement outlining Party Manchester&apos;s Health & Safety procedure for setting up disco equipment has been provided. Party Manchester has provided Risk Assessments undertaken at events sourced via needadisco.com, indicating that they can undertake these competently. Why do people choose to book Party Manchester? "all party guest commented how good paul was with getting everyone in the room up dancing and participating in the games." 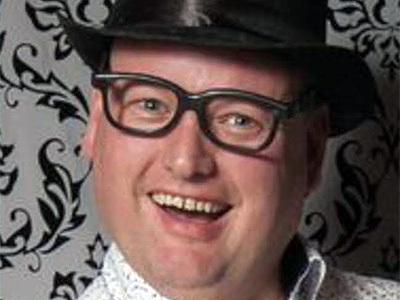 "Paul was a very good DJ, very polite, punctual and professional. I gave him a very long play list of requests and he managed to play a fair few, checking with me for any particular favourites that I definitely wanted. He was also good at getting a very mixed crowd up and into the spirit of things!" "Very good dj got the guests up and dancing very good music and lighting"
"I would definitely recommend this DJ Paul as got people up dancing and the photos was an extra bonus brilliant "
"Paul sent the lowest quote, but I don\'t think I could have had a better service. He played my 'eclectic' playlist (including Heavy Metal, Calypsos and kiddies' songs) and unobtrusively kept the party going. He even took some great photos - which are now on Facebook - at no extra cost. I would not hesitate to recommend Paul." "you are more than welcome, its all part of the service.. Its always your party, your music.. Not mine !!" "Clearly professional and experienced in the business, the DJ providing music and entertainment throughout the evening which was suitable for all ages." "Paul was excellent and kept the party going. The photos at no EXTRA cost was a nice touch." "No problem photos are a standard feature of all our packages. People need to remember the special events in their lives.."
"Paul came to see us before our party to go through the evening - he also has a site which allows you to choose the songs you would like to be played. Throughout the night Paul took photos of the party which is a huge added bonus. Many of the guests commented on how great he was, would definitely recommend using Party Manchester!!" "Thank you, I look forward to working with you again soon..."
"Thanks for all your hard work. You made my mums 50th a brilliant night to remember! You guys are excellent. Would defiantly use you again." "You are more than welcome,that was a great venue, and a really nice bunch of people." Party Manchester also offers a range of additional party services not directly linked to musical entertainment. 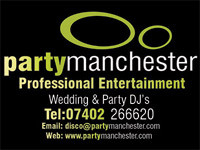 Get FREE no-obligation disco quotes from Party Manchester and other DJs covering your venue. Take 2 minutes to fill in some basic details and we'll do the rest! If you are contacting Party Manchester about an event, it's always a good idea to include the DATE, LOCATION, EVENT TYPE, AGE GROUP and TIMINGS to speed things up!